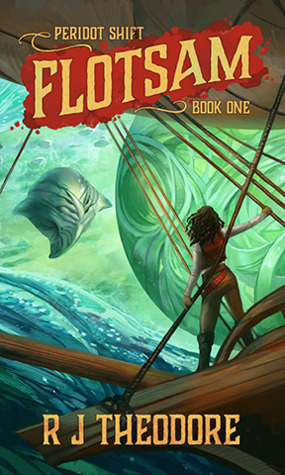 The first book in the steampunk/science fiction series Peridot Shift. I got an ARC from the publisher. Talis is the captain of Wind Saber, a small airship with a total crew of four people. To keep her vessel in the air, Talis is sometimes forced to take jobs which are borderline legal, or outright illegal. Like the one that starts the story. One of the few fences Talis trusts offered her a job that looked easy enough. An old ring needed to be retrieved from the wreckage of an airship. Talis agreed to the job even though the payment barely covers for the cost of the equipment needed for diving the wreck. However, she thinks that she can do similar jobs in the future, so the cost is really an investment. Her crew agreed. The only problem is that anything found from wrecks are the property of the Cutter Empire, so they’ll have to be fast and silent. Unfortunately, only moments after Talis gets the ring, an Imperial warship appears, and its captain is none other than Hankirk with whom Talis had a fling years ago when they were both in the Imperial Academy, and now they loath each other. After a battle, which will no doubt put Wind Sabre on the Imperial most wanted list, the Wind Sabre manages to escape. But when Talis tries to bring the ring to the fence, she and her crew are attacked and later they find the fence murdered. Talis has no idea what’s going on, but she needs to get rid of the ring and with a price that will cover some of her losses. This was a very enjoyable read. The world-building is good and very interesting. The planet Peridot was destroyed in the past and only the powers of the five gods, the Divine Alchemists, kept the world together as islands of floating lands. The Divine Alchemists recreated the plants, animals, and everything and created five races, each in the image of one of the alchemists. Two of them look pretty much human while the rest are somewhat different. The world has also aliens which use starships to come from different planets. The people of Peridot don’t really know much about them. In addition to two lift balloons and maneuvering and stunsails, the airships have steam engines, too, to propel them across the skies and between different islands. The planet has been divided into five areas, one for each race. There’s the Cutter Empire and the Bone islands are ruled by a sort of tribal council. The crew of Wind Saber includes Dug who is a fearsome warrior, the first mate, and Talis’ best friend, Sophie who is the wrench, or mechanic, and Tisker who is the pilot and a former street urchin. They’re quite a close-knit group. They each have their own pasts and personalities. Talis is the only point-of-view character so we naturally get to know her the best. She seems like an experienced captain, very protective of her crew (especially Dug) but not so great at long-time planning. She also has a dry sense of humor. All of the crew are able to defend themselves and can kill people when necessary. I also really enjoyed the deep friendship between Dug and Talis: they’re friends through thick and thin but not lovers. Besides Talis and Sophie the book has several interesting female characters. But for me the aliens almost steal the show. We get to know a bit more about them, but I’d love to know more. For example, they use pronouns not to identify gender but class, and they have over fifty pronouns. Also, the story doesn’t include romance which I really appreciated because courtship romances are so very common that’s noteworthy to find a book without one. I’m eagerly waiting for the next book and really hoping that it will be just as good. The first book in a new SF series. Adda is a hacker/software engineer and Iridian is a former soldier who’s now a mechanical engineer. They’re a couple and have just graduated and found out that jobs are hard to get after an interstellar war. So, they decide to become space pirates. 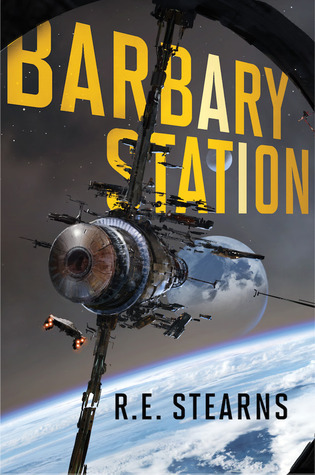 In order to make a great impression on their intended captain, they hijack a colony ship, dreaming of living in luxury on the Barbary Station. They have little trouble with the hijacking, but before they reach the station Adda’s brother Pel, who has recently joined the pirates, sends them an urgent message asking them not to come. But the message comes too late. When the lovers arrive at the station, they find out that pirate life is not like they imagined it. In fact, it’s a far cry from what the pirates themselves keep telling people. The pirates, and the civilians left behind in the station’s evacuation, are trying to survive as best they can with too little spare parts and even less expertise with repairs. They’re suspicious of all new-comes who have to prove themselves worthy of staying. Also, the station’s AI is trying to kill them. Adda and Iridian have their work cut out for themselves. Despite both being engineers, Adda and Iridian have distinct personalities. Adda is an introvert who’s more comfortable with computers than people. People can make her uncomfortable, except for Iridian and Pel. She’s happiest when working hard alone and takes a drug that helps her concentrate harder than usual. Iridian is far more sociable and even enjoys the people. She’s the one who tries to make friends with the motley crew of pirates while Adda works alone. Most of the rest of the cast are left pretty vague, except for Adda’s younger brother Pel who is trying to be useful any way he can. The pirates’ captain Sloane is a very interesting character, but we don’t know much about them, not even their gender. The rest of the crew are colorful. This was a fun ride. It’s has lots of stuff I’ve wanted to read about, such as an established couple (instead of courtship romance) working together, a sibling relationship, and cool space pirates. Some of the world-building stuff was pretty vague which might irritate other people. The techie talk went way over my head and I have no idea if it’s made up or real. And in an audiobook it went by pretty fast. 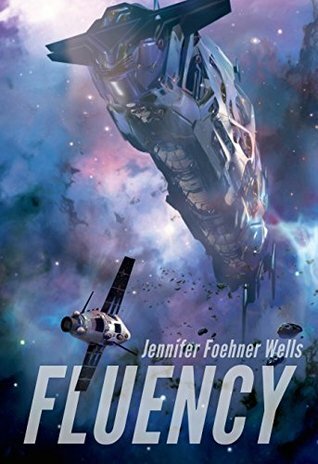 The first book in the science fiction (romance) series Confluence. Alan Bergen is an astronaut and a scientist. He’s also one of the few people on Earth who knows that an alien vessel has been in the Greater Asteroid Belt since 1960s at least. It seems to just be drifting and no activity has been recorded in that time. It’s huge, the size of a city. However, now an asteroid is in a collision course with it and so NASA is in a hurry to send a team there. Bergen is one of the team members. Dr. Jane Holloway is a brilliant linguist and has also survived in tough situations on Earth. NASA sends Bergen to persuade her to join the small team. Jane almost says no because she’s not too keen on going to space, after all. However, finally she agrees. Publicly, the team is going to Mars but heads to the vessel. The book starts when the team has reached the vessel after a ten month journey in the capsule Providence, but we get flashbacks about Jane and Alan’s relationship before launch. Jane (and this reader at least) expects to put her linguistics skills and instincts to good use, deciphering an alien language and if there’s anyone alive possibly even communicating with it. However, quite soon Jane realizes that someone on the ship, possibly the ship’s A. I., is mentally communicating with her. She decides not to tell that to the rest of the team. While she does some deciphering of alien language, she does it almost by magic. So, this book turned out to be quite different from what I expected. Instead of doing actual linguistic work, Jane interacts with the alien presence in her mind. During those times, she’s unconscious or asleep. Not surprisingly, the other team members start to be suspicious of her. Except for Alan. The story has a strong romantic element between Alan and Jane. It seems that Alan fell for Jane on Earth and has been pushing away his feelings during the long voyage to the asteroid belt while Jane is attracted to Alan but is very cautious about romance because of the way her ex-husband treated her. Alan’s reputation as a womanizer also turns Jane off. The story does have the team exploring the alien ship which was quite interesting. The rest of the team consist of Commander Mark Walsh who is quite militaristic and suspicious of everything, a young astronaut Ronald Gibbs, an experienced astronaut Thomas Compton, and a female doctor Ajaya Varma. The story focuses on Alan and Jane and their budding relationship. Alan is a driven in his profession but quite insecure with Jane, unlike with the other women he’s had before. Also, he’s almost insanely trusting of Jane which turns out to be a good thing because Jane’s the main character. He’s also quite protective of her, even against the other team members once they start to be suspicious of her. Jane seems like a confident person at first but she’s really out of her depth here. She also has some issues in her past which she hasn’t dealt with. She’s unsure of herself and not sure why Bergen would be attracted to her. She seemed like a much young person that she’s supposed to be. Unfortunately, what the team encounters on the ship is quite predictable, if you’ve seen a few horror-sci-fi movies. The book doesn’t really have an ending. It just stops. The book has an interesting premise but unfortunately, it didn’t live up to it. Or I was just expecting a different kind of book. The first book in an alternate reality series set in modern times. The story starts in the present-day New York but in another reality. Karen Brown is a pretty ordinary young woman with a low-level job at a marketing firm. But her real passion is her volunteer work at the Kew Park. However, when she asks a group of young men to stop harassing an old Native man she has no idea what sort of trouble she finds herself in. One of the men has very influential parents and Karen is banned from the park. But soon she has a lot of other things to think. Strange men follow her, and she meets a particularly handsome man who seems to take a special interest in her. Then she finds out that her family isn’t quite whom she thought them to be. Her mother, who passed away years ago, left her a legacy which her uncle and aunt have kept a secret from her after her father’s death. Soon, government agents are harassing her, and her only ally is that handsome man from Nova Roma. Should she trust him? This is a modern-day thriller but set in an alternate reality where a group of powerful Roman families established their own country, Roma Nova, which survived to the modern day. However, the Roman customs had to give way to more practical considerations and in this country, and world, women are able to rise to powerful positions and do so. Even though Karen’s mother is from Roma Nova, she doesn’t know anything about the country and we find out alongside her. However, we don’t really see much about the day-to-day customs which was a small disappointment. I would have loved to see more of the ordinary Roma Novans. The first part of the book is a fast-paced thriller but in the second part things slow down quite a bit and Karen’s character development takes the center stage. She chooses to change quite a lot and becomes responsible for her own life and choices. While she isn’t a timid person at the start, she is quite a normal young woman without any experience with criminal matters or anything like that, so she feels quite out of control and even a victim at times. Later the pace quickens again somewhat but not as much as it was at the start. That’s not a complaint, though. Karen’s life changes quite a bit and it’s natural that it doesn’t do so in just a few days. In fact, the story has been divided into four parts, which correspond with how Karen’s life changes. They’re almost episodic, like a miniseries instead of a continuous story (again not a complain but an observation). Unfortunately, there were a couple of things I didn’t care for. One of them was how quickly Karen becomes a fighter and not just an ordinary fighter but with some very special skills which I doubt can be learnt in just a couple of months. Also, Karen’s change in circumstances seems like wish fulfillment. The cast of characters changes three times in the book while Karen’s life changes, too. At first, she has only one friend in the ad agency and any friends she made at the park do not contact her again. Later, we get quite intriguing characters, a couple of them powerful and elderly women. The story has the obligatory romance, too. I didn’t mind it at first, because we didn’t get the usual nonsense reasons stopping them from getting together. Unfortunately, those reasons did come up later. But even though I’m not a romance reader, I wasn’t too annoyed by Karen’s romantic entanglements. In fact, I was content with the ending. The story is written in first person POV. There are also brief chapters from the POV of the main antagonist, a high ranking and very skilled man who has a personal grudge against Karen. Some of the next books in the series are in audio, so I’m going to try the next book, Perfiditas, in that format. Carl invites all of us to take part in his 2018 Sci-Fi Experience. c) Experience for the first time just how exhilarating science fiction can be. If you have ever wanted to give science fiction a try, or are already a fan of the genre and are looking for a group of kindred spirits, this is the event for you. This is a very laid back event. There are no challenges to meet, no limits to how little or much you can participate. You can read short stories, novels, comics, art books…anything with a science fictional bent. You can read nonfiction about space, space travel, other planets, etc. You can watch television shows, films, YouTube series. You can play video or table top games. You can also just fire up your blog and wax eloquent about those science fiction artists whose work you admire. I’m delighted to see this event back. I love SF and I love to read reviews, musings, anything with an SF twist. I’m joining but I don’t know yet with how many posts. Currently I’m in the middle of two fantasy books and also one which is set in modern day but in an alternate reality. So, I guess that last book can be categorized as SF. 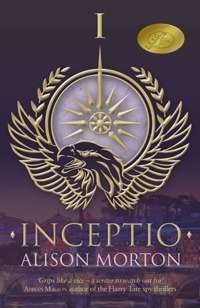 It’s Alison Morton’s “Inceptio” the first book in the Roma Nova series. I’ll have the review up soon. Otherwise, I’ve downloaded quite a few free books this year and while most of them are fantasy, there are also many science fiction books among them. Of course, Christmas time is a busy time otherwise so I’m hoping that I’ll have time to read more in January. Of course, I’m going to watch the new Star Wars movie (tomorrow!) but the net is going to be full of reviews and opinions about it. I’m also watching the third season of Flash and some other superhero shows, but I don’t know if I’ll write about them.